I love brain teasers and have ever since I was a kid. Whether they came from books or classic adventure games, I fondly remember spending hours thinking about them. And no series of games cashes in on my brain teaser nostalgia quite like the Professor Layton series. Thus I was first in line this last week when the sixth game in the series, Professor Layton and the Azran Legacies was released on the 3DS in Japan—the final game staring series protagonist Hershel Layton. And, for better or worse, it's exactly what you've come to expect from a Layton game. Perhaps the most interesting thing about The Azran Legacies is that it is the final game in the prequel story arc that started in The Last Specter and continued through The Eternal Diva, and The Miracle Mask. The game starts off strong with the discovery of a mysterious ancient girl frozen in ice and drives directly in to her subsequent kidnapping/rescue. It's quick paced and action packed, with a large helping of anime cutscenes to keep you invested. 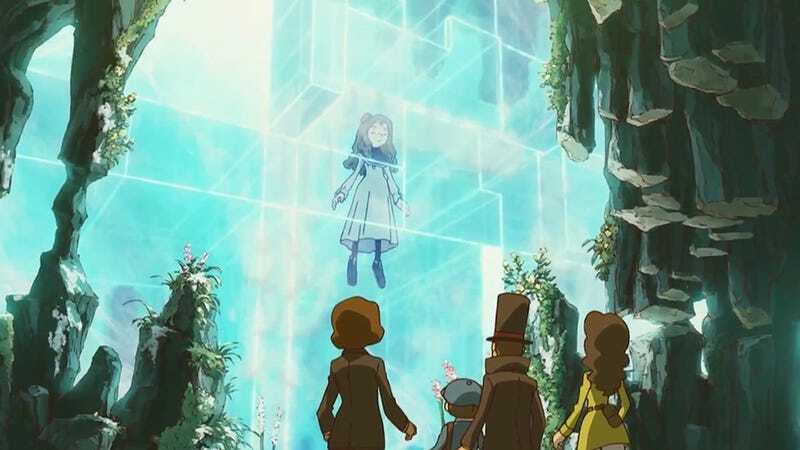 When I reviewed the Layton film The Eternal Diva earlier this year, I was left with many questions, especially about the villain Descole and his interest in—and participation in—the events of that story. The Azran Legacies does a good job at answering his character motivations and links the major items of the film/games—like the Nautilus Chamber and the city of Ambrosia—to one overarching mystery surrounding the ancient Azran people. pace of the story devolves into a giant fetch quest, where Layton and Co. are attempting to retrieve five eggs from various locations around the world. While each setting is distinct and filled with its own characters and side story, none feel important enough to the overall story to keep you invested. In other words, it just feels like padding—trying to distract you from the main plot rather than building towards the eventual climax. However, this padding does improve the gameplay by providing more to do than just revisit the same locations over and over again, searching for more puzzles. It also serves to inspire the puzzles by setting them in these varied locales. So if you are a player who likes searching out every single puzzle, this portion of the game isn't so bad. But if you are anxious to get on with the main plot, it feels like you are trapped in an endless holding pattern. twisting wheels, moving through mazes, reconstructing pictures correctly. The puzzles in The Azran Legacies, on the other hand, tend to be abstract word problems—i.e., which person is lying, how many of a given object do you need, etc. While neither type is intrinsically bad, if you, like me, enjoy the physical puzzles more than the abstract ones you may find yourself disappointed in many of the game's puzzles. While all the anime cutscenes are voiced—as are the key story moments—the vast majority of the game lacks voice acting. It's not as if the story is made objectively worse by the lack of voices, but additional voice acting would be a great boon to the slower parts of the story by keeping us more invested in the characters emotionally. Other than being the ending of the prequel story arc, Professor Layton and the Azran Legacies is just another Layton game. However, this is not necessarily a problem. If you like Layton games with their brain teasers and steampunk adventures, you will find plenty of what you love here. But if you've already given a past Layton a try and found it wasn't for you, you will find nothing in Professor Layton and the Azran Legacies to change your mind. It is a game that knows what it is and finds no reason to change it up this late in the series' lifespan. Professor Layton and the Azran Legacies was released on February 28, 2013, for the Nintendo 3DS in Japan. As of yet, there has been no confirmation of a Western release.